B ritish-born, New York-based artist Cecily Brown is an integral figure in the current resurgence of painting. The Louisiana Museum opened an exhibition to celebrate her work as a part of a succession of shows dedicated to contemporary painters that include Peter Doig and Daniel Richter. Curator Anders Kold describes the exhibition, which features drawings, monotypes and paintings, as a "mini-retrospective." The monumental exhibition is a display of works produced since 1997 and is the first major European exhibition devoted to Brown's work in several years. 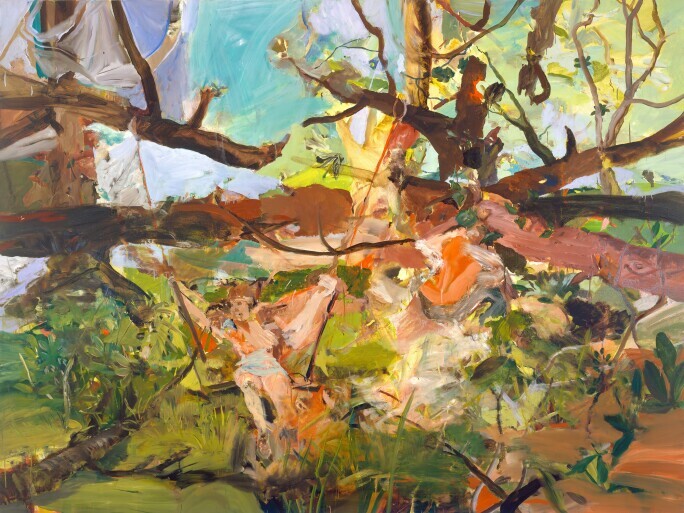 Cecily Brown, Thug in Landscape, 2015. Image courtesy of the Louisiana Museum of Modern Art. Throughout her career, the artist has maintained a highly original, painterly style in her work, often melding figuration with abstraction. The brushstrokes convey turbulence, reflecting a myriad of tensions, conflicts and distractions that characterize much of contemporary life. By creating fragmented canvases, Brown engages with urgent contemporary changes while also alluding, sometimes directly, to the works of historical artists who have been influential to her work, including Bruegel, Hogarth, Géricault, Degas, and Manet. One highlight of the exhibition is a perfect example of the artist evoking historical art, while simultaneously producing a politically current piece. The eponymous triptych Where, When, How Often, and with Whom, 2017, which alludes to sources including a viral video of French police harassing a sunbathing woman in a burkini, and French painter Theodore Gericault's Rath of the Medusa, 1818-19. Cecily Brown: Where, When, How Often, and with Whom, Louisiana Museum of Modern Art, Humlebaek, Denmark, 8 November-10 March 2019.